What does the ideal click and collect service look like? Click and collect has now become a must have for online retailers and it isn’t just restricted to the multichannels. Click and collect can be a sales driver. Customers who aren’t always available for home delivery will prefer the option of collecting from stores or other locations at their convenience. Retailers offering the service should promote it throughout the site, in various places. It may seem obvious, but there’s little harm in making the process clear to any buyers who may be unsure. Whether or not the product customers want is available locally can be a deal breaker. 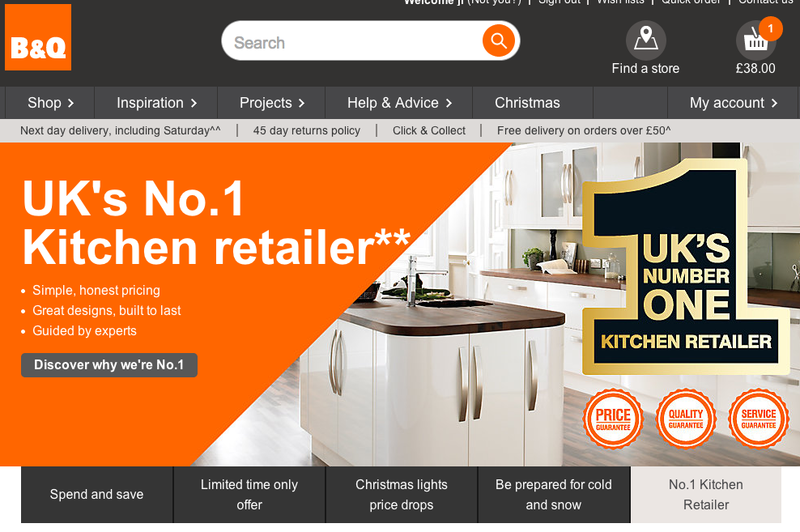 Rather than making customers select items and go part of the way through the checkout process before finding out about availability, it’s best to let them search from the product page. Schuh allows you to select a size and location and check stock from the product page, and then offers the option of buying or reserving. The information provided around these options is also excellent. Argos allows customers to select a preferred store, which it then defaults to for future purchases. It also has a ‘fast reserve’ option so repeat customers can select to reserve at their ‘home’ store with a single click. Click and collect services require users to select a pick up location, and this process needs to work smoothly. Some features can make the process easier, such as allowing them to enter the first half of the postcode, or the town name, as well as providing shortcuts (location services on mobile for example). 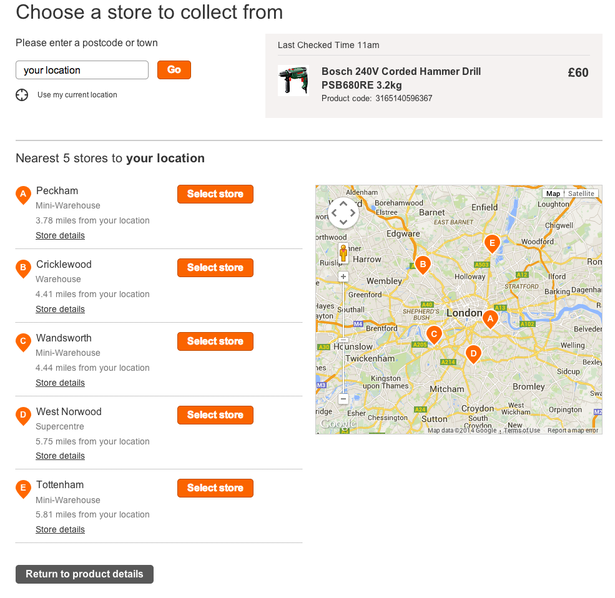 Here’s an example from B&Q, where customers can enter a postcode, town, or allow the site to detect your location. Argos provides a similar option, though the information on whether stock is available to collect immediately or the next day is very useful, as are the store opening hours. Click and collect is popular with mobile shoppers, so it’s important to ensure that these services work just as well on a smaller screen. The Argos app is a prime example, with a design tailored to users on the move. It’s important that retailers get the in-store experience right for click and collect customers. If people have decided to buy something, they will often want it ASAP. This is often about the ability to check in-store stock levels, rather than rely on delivery to stores from a central location. John Lewis is an example of this. Its click and collect proposition is for next day collection, so stock is obviously being shipped from a central location. So, the item you want could be in a John Lewis store a few miles away to collect within the hour, but the website can’t tell you this. Of course, the integration of systems required to deliver this isn’t necessarily straightforward, but it’s an ideal to aim for. Retailers that can offer fast pickup do have an advantage for those with that ‘want it now’ mentality. While in-store collection is the most popular option, there are now plenty of alternatives that can offer more to customers, such as lockers, and collection from local convenience stores and petrol stations. These options, such as Collect+ and Amazon Locker, also allow the pure plays to add click and collect to their proposition. Here, Littlewoods, now a pure-play, offers Collect+ for pick up, which has a network of more than 5,000 local shops and garages. This is simple, but very useful. Argos texts me as soon as I make a reservation, providing the order number. All I need to do is turn up and show them the text. How should ecommerce brands be using content? Ecommerce brands have embraced content marketing over the past couple of years. Of course some, like Net-A-Porter, have used content effectively long before it became a buzzword. However, while some are using content well, others just seem to be ticking boxes and failing to incorporate content fully. In this post, I’ll look at how ecommerce brands should be using content, and some of the mistakes to avoid. When should you give away something for free? Giving away products for free is far from sustainable, but then again there’s a time and a place for everything.